BARCELONA STRIKER LUIS Suarez left the pitch in tears as he pulled up with a muscle injury just short of an hour into the Copa del Rey final against Sevilla on Sunday. Suarez is now a major doubt for Uruguay’s Copa America campaign in the United States next month. The former Liverpool striker scored 59 goals for Barca this season to lead them to the La Liga title, but couldn’t break the deadlock before being replaced by Rafinha with the score at 0-0 and Barca down to 10 men following Javier Mascherano’s first-half red card. Suarez only returned to competitive international duty in March after completing a lengthy ban for biting Italian defender Giorgio Chiellini at the 2014 World Cup. Uruguay face Mexico in their opening Copa America match on June 5 before also playing Venezuela and Jamaica in Group C.
Email “Tearful Luis Suarez limps out of Cup final”. 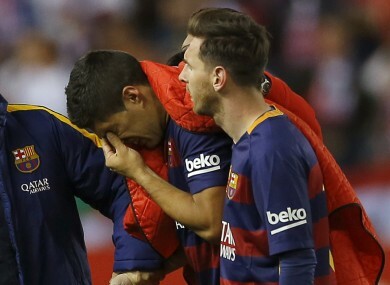 Feedback on “Tearful Luis Suarez limps out of Cup final”.